Visit the Chinese Cemetery and discover how the Chinese came to BC. In 1887, a Kamloops Sentinal newspaper reporter stumbled upon a Chinese grave site dating back to the 1860’s. Today, the Kamloops Chinese Cemetery is valued as one of Canada’s largest and oldest intact Chinese cemeteries and as a symbol of the transition of the Kamloops Chinese community from temporary to permanent in the 1920s. It contains marked and unmarked graves of the Chinese who lived and worked in Kamloops, as well as monuments associated with traditional death ritual practices. Many of the Chinese buried there came to Kamloops to work on the Canadian Pacific Railway which was built through Kamloops in the 1880s. Over 17,000 Chinese workers were brought in to build the Yale-Kamloops line. At the conclusion of the project, many Chinese settled temporarily in Kamloops, increasing the Chinese population to over 400 residents by 1890. Chinese residents were given a small section west of First Avenue in the original town site for their Chinatown. 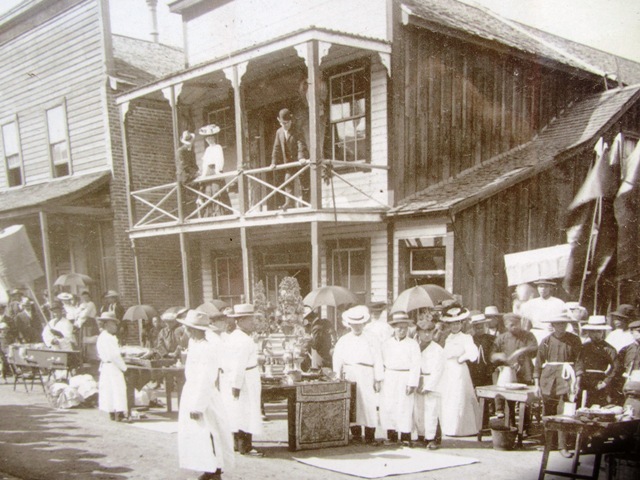 The majority of early Chinese immigrants in Kamloops were there temporarily, intending to return home to their families after five to ten years. First mentioned in the Inland Sentinel in 1887, the Kamloops Chinese Cemetery was set up by the Chinese as a temporary burial place. As the Chinese were banned from burying their deceased in the Pioneer Cemetery, the Hudson’s Bay Company allowed them to select a burial site on land south of town. The site is demarcated by a wooden picket fence, and a stone altar and burner were placed at the north end of the cemetery. Graves remained unmarked until after the Chinese Exclusion Act of 1923, when Chinese began to settle permanently in Kamloops. This change is clearly indicated by the introduction of permanent, marked tombstones, first installed in 1927. Most marked graves date from the 1930s to the 1960s. The Chinese Cemetery was closed in 1979, and the site now contains approximately 125 burial plots, over 50 of which were disinterred. In recent years, members of the Chinese community have been actively involved in restoring and rehabilitating the Chinese Cemetery as a place of community commemoration and worship, through a partnership between the City of Kamloops and the Kamloops Chinese Cemetery Heritage Society. 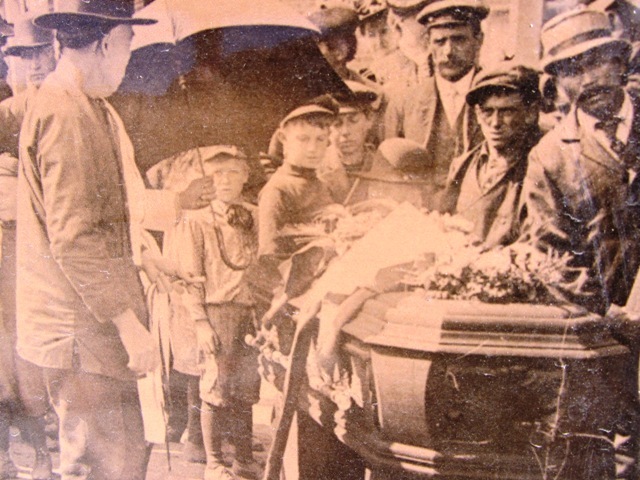 These pictures show an elaborate Chinese funeral which took place in Kamloops in the late 1800’s or early 1900’s. A sign at the site tells the story of Mr. Lau, a laundry owner in Kamloops for many years who was buried in the cemetery. After his death his wife and family moved to the United States, where Mrs. Lau eventually died. Mr. Lau’s grandson wanted to move his grandfather’s remains to Sacramento, California to be reburied beside his wife. Before coming to Kamloops, the grandson had a dream. His grandfather came to him in this dream and told him that he did not wish to be moved. He liked it where he was. When Mr. Lau’s grandson arrived in Kamloops he recognized the cemetery as the one he had seen in his dream. He said he could now understand why his grandfather felt at peace in these surroundings, because the view of the river and mountains was so beautiful. Mr. Lau continues to lie at rest in the cemetery. The Chinese Cemetery is located at 850 Lombard Street in the West End of Kamloops off Centre Avenue.